HomeArticlesDid the Prophet (s.a.w.a.) frown at the blind man? According to some Muslims, the Holy Prophet (s.a.w.a.) notwithstanding all the verses and traditions extolling his virtues and perfections was given to making errors and mistakes (Allah forbid). They claim one such incident occurred at the time when a blind man named Abdullah Ibn Umm Maktoom, the muezzin of the Holy Prophet (s.a.w.a. ), approached him (s.a.w.a.) for some guidance. But at the time, the Messenger of Allah (s.a.w.a.) was preoccupied with certain rich and influential Arabs. So, he (s.a.w.a.) turned his face away from Abdullah in disgust and frowned upon him for interrupting his conversation with the Arabs. The incident under question is mentioned in the first few verses of Surah Abasa (80). First and foremost, when the Muslims have already acknowledged the Holy Prophet’s (s.a.w.a.) perfect morals, there is no place to entertain any tradition or even a whimsical interpretation of a Quranic verse. Because the Quranic verses about the Noble Prophet’s (s.a.w.a.) perfect behavior are certain and undisputable (mohkam) and hence, everything that contradicts them is either weak or ambiguous (mutashaabeh) at best. If we accept both as true, then we have believed there is contradiction in the Book of Allah. This means we have disbelieved in the Holy Quran which claims there is no contradiction in it (Surah Nisa (4): Verse 82). Also, these Muslims must strike a balance in their arguments. For instance, when there is any talk of Ayesha’s transgressions, the Muslims are quick to refute all points simply by referring to Surah Noor (24): Verse 11, even though this verse does not mention Ayesha by name and according to many interpreters of the Holy Quran, it refers to the honorable Maariyah Qibtiyyah (r.a.), the virtuous wife of the Holy Prophet (s.a.w.a. ), who was the only other wife apart from Hazrat Khadijah (s.a.) to bear him (s.a.w.a.) a child. When the Muslims are so quick to defend Ayesha on an ambiguous verse, they must show some fairness when it comes to defending the Holy Prophet (s.a.w.a. ), the one on whom all verses were revealed. If they can’t defend him (s.a.w.a. ), at least they should not be so ungrateful and oppressive so as to level false allegations against the Noble Prophet’s (s.a.w.a.) immaculate morals. 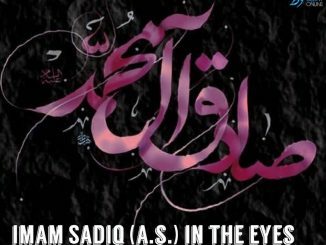 Even the infidels and Jews acknowledged the Messenger of Allah’s (s.a.w.a.) morals and accepted Islam often on this point alone. What is wrong with these Muslims that they have fallen below the level of the infidels and the Jews! The Holy Quran has underscored the Prophet’s (s.a.w.a.) immaculate morals in many places. These verses are certain and there is no dispute among Muslims about them. These verses are clear and undisputable as regards the Prophet’s (s.a.w.a.) morals. Therefore, no other verse or incident or tradition can be advanced to contradict these verses. We must either reject them or find another explanation for them in case of a Quranic verse. This is an established fact and no Muslim scholar can dispute it. If the verse is about the Holy Prophet (s.a.w.a. ), then it must be in the second person. If it is in the third person, it cannot refer to the Holy Prophet (s.a.w.a.) and has another addressee. Therefore, the Quranic verses about a person frowning on the blind man does not refer to the Prophet (s.a.w.a. ), it refers to another person. This is clear to any student of grammar since the verses are in the third person. Scholars of the Holy Quran have documented this incident in their exegeses of the Glorious Quran. Abdullah Ibn Umm Maktoom was a blind man. He was the muezzin of the Prophet (s.a.w.a.). He was a good Muslim. One day, he approached the Holy Prophet (s.a.w.a. ), while he (s.a.w.a.) was busy with his companions. The Holy Prophet (s.a.w.a.) directed him to Usman Ibn Affaan, who was among the companions. However, Usman frowned on Abdullah and turned his back on him. It should not surprise anyone that Usman Ibn Affaan is the one who turned his back on the blind man due to the latter’s poverty and low social position. The Holy Quran has shown the Prophet of Allah (s.a.w.a.) as the perfect model in etiquette and Usman Ibn Affaan as an arrogant human being. Then why do these Muslims accuse the Prophet of Allah (s.a.w.a.) as the culprit instead of Usman regarding the incident of the blind man? The answer is simple – to protect the honour of Usman Ibn Affaan. And this is not the only case. There are scores of verses, traditions and incidents that were revealed for one person but were later associated with another person only to honour or dishonour someone as the case may be. This task was undertaken by Muawiyah Ibn Abi Sufyan to justify the selection of the caliphs and to discredit the Holy Prophet (s.a.w.a.) and his Ahle Bait (a.s.). Unfortunately, subsequent generations of Muslims, including their best scholars, have fallen prey to this deception and have failed to see the truth even when it is staring them in the face. These Muslims, who are quick to stand for the rights of caliphs and wives, must realize that the Holy Prophet’s (s.a.w.a.) honour and high morals need to be defended with greater ardour, zeal and enthusiasm. Instead of blaming and cursing Shias for maligning caliphs and wives, why don’t these Muslims check their own so-called authentic books (Sihaah) and do some introspection on whether they have dealt with the Holy Prophet (s.a.w.a.) justly? Is defending the caliphs more important than defending the Prophet of Allah (s.a.w.a.)? If defending the Holy Prophet (s.a.w.a.) is all-important and it is like that, then why do they criticize the Shias for defending the honour of the Noble Prophet (s.a.w.a.)? As far as the caliphs are concerned, when Allah the High Himself, has criticized them in so many places like in the verses of Surah Abasa and Surah Hujuraat, why blame the Shias alone? The Shias are only doing what Allah Himself has done.